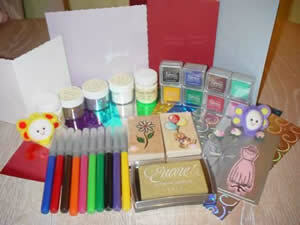 Welcome to Artie-Kraftie your one-stop-shop for Card Making and Scrapbooking Supplies. This is a small family run business here to help you with all your card craft & scrapbooking needs. Artie-Kraftie maintains a high level of customer service at all times. Fast and reliable FREE DELIVERY anywhere in the UK for orders over £30. Please browse the website and check out our extensive range of products and great value prices. Delivery is worldwide. Low postage £2.00 up to 10.00, £4.00 up to 20.00, £6.00 up to £30.00. FREE postage anywhere in UK when over order over £30.00 .